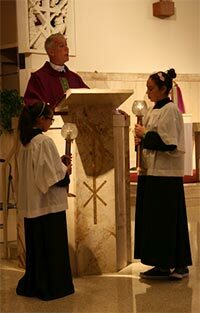 The St. Francis De Sales Altar Server program is a wonderful opportunity to learn more about our Catholic religion and to become more involved in our church community. The program is open to both boys and girls in 6th, 7th, and 8th grades who have received the sacraments of Baptism and First Holy Communion in the Roman Catholic Church. Students are invited to attend mandatory training sessions in the Spring of their 5th grade year, in preparation for beginning to serve in the Summer before 6th grade. For any questions regarding the program, please call the Parish Center (818- 784-0105).